Masdar Plot J05 is located within the Masdar master plan, located in the Emirate of Abu Dhabi and in close proximity to Abu Dhabi International Airport. The plot lies to the Southeast side of the master plan and forms a line of light industrial uses on the periphery of the Masdar sustainable campus. Masdar City is located within Abu Dhabi Municipality. It is located adjacent to Abu Dhabi International Airport with strategic connections to both Abu Dhabi Island and Dubai. Masdar is on a mission to advance the clean energy industry in Abu Dhabi and around the world, and it is a catalyst for the economic diversification of the emirate. The Mubadala Development Company, which is owned by the Abu Dhabi government, established Masdar as a wholly owned subsidiary in 2006. Masdar is guided by The Abu Dhabi Economic Vision 2030, a programme that drives new sources of income for the emirate and strengthens its knowledge-based economic sectors. Masdar takes a holistic approach to its organisation, with interconnected businesses focussing on Clean Energy Deployment and Sustainable Real Estate. Masdar Institute, an independent, research-driven graduate university, rounds out the organisation. With each unit focused on a key component of the value chain, Masdar operates with the broad scope needed to meet the most pressing sustainability challenges of tomorrow. This keeps Masdar at the global forefront of the clean energy industry as we pursue pioneering and commercially viable technologies and systems. 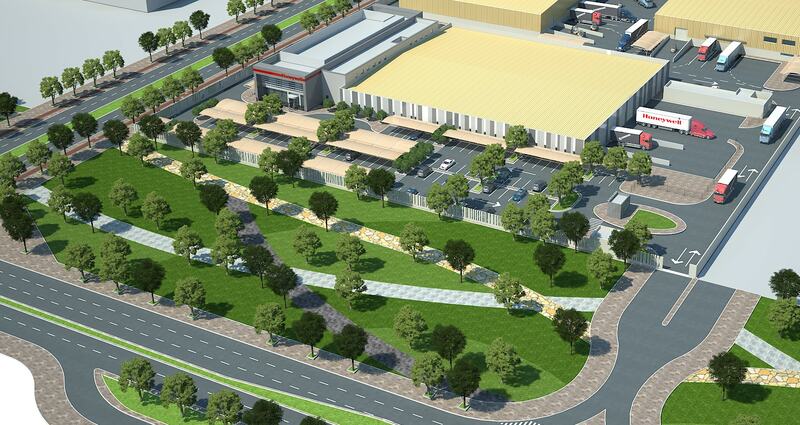 The project is an offices and warehouse facility incorporate the highest design standards in the field, to secure provision of safe, efficient and uninterrupted operations. The site has been developed with a primary user, Honeywell, located at the front of the site and a series of secondary users located at the rear. The plot will be developed in 2 phases following this approach. The site arrangement follows the guidance as defined within the Plot Affection plan. This allows for a 30m building line setback from the Northwest proposed highway and a 10m setback from all other sides of the plot. Building entrance, reception & client meeting spaces and open plan work spaces. Building warehouse and ancillary / staff spaces. Loading bay and key mechanical, electrical plant. The access road to the plot is located as per the Affection plan on the Southwest corner and will be utilized for all staff, visitors and goods vehicles. This access will be utilized for both Phase 1 and Phase 2 works. The building forms have been developed to provide Honeywell with both a working series of office and presentation spaces and a warehouse for the primary purpose of assembly and testing of its core business. The building forms have been derived to provide an environmentally conscious solution to the Middle East climate and this can be seen in the recessed East and west facades and the layering nature of the North and South facades. The warehouse façade follows the patterning of the office elevation with windows punctuating the insulated panels. Roof glazing is to be minimized to limit heat gain where possible. The front portion of the building, housing the reception, ancillary office areas, meeting rooms, Wc’s, Prayer rooms, IT areas and staff spaces is designed as a simple concrete frame with a highly insulated façade system. The majority of mechanical plant will be situated here. The warehouse is designed as a steel large span frame with intermediate columns, this allows for a flexible working environment and a defined series of internal zones as required by the end user. As part of the Masdar master plan, the plot meets the 3 Pearl Estidama target. 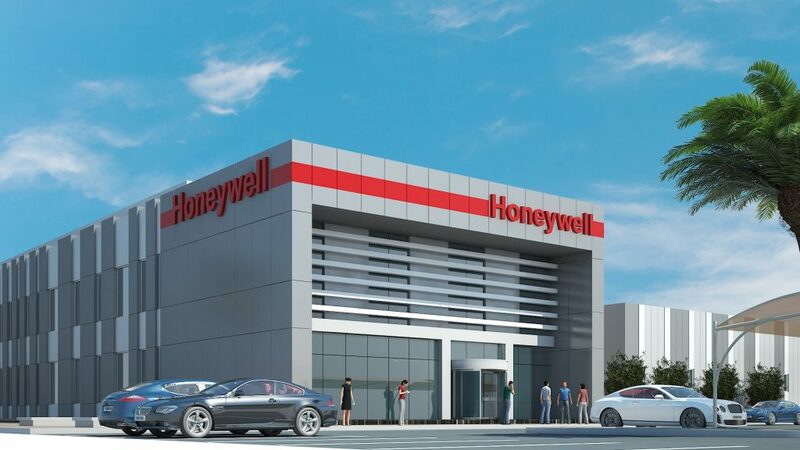 The business operating from the Masdar facility will be Honeywell Process Solutions (HPS) which belongs to the Honeywell Automation & Controls Systems Strategic Business Group. The ‘end product’ is an IT Cabinet that has been tested, approved and accepted, with the customer, on location at our on-site facility which can then be delivered to the customer’s off-site location of business. At any one time there could be 1,000+ IT cabinets in the testing facility. The customer will normally place a team in the Honeywell facility for a period of 7-10 days to support this process and this can be upwards of 20-30 people. Hence the facility must have sufficient customer parking and desks within the IT Process Workshop facility to accommodate the customer acceptance teams. Operations follow the global Honeywell Operating System (HOS) creating and developing efficient and lean operations, along with HSE principles (Health Safety & Environment) and a QMS (Quality Managed System) to capture and enable continual improvements. Sourcing, ordering, purchasing, receiving delivery, assembly and testing (alongside customers / end users) are all undertaken from the facility. Supported by business development, legal, and other core functional support to service new and existing customers needs.